Minneapolis, Minnesota (May 10, 2013) – The last time the median home price for the Twin Cities 13-county metropolitan area was higher than it was in April 2013 was September 2008, marking the 14th consecutive month of year-over-year price gains. New listings were up 7.7 percent over April 2012 to 7,057 properties, and signed purchase agreements were up 16.0 percent to 5,507. This is the highest pending sales count since May 2006. For the same time period, there were 4,138 closed sales, and inventory levels declined 29.3 percent to 13,113 active listings. Driven by the changing mix of sales, solid demand and falling supply, the median home price for the Twin Cities metro rose 12.2 percent to $182,312. The percentage of all new listings that were traditional, non-distressed homes rose to 77.9 percent, its highest level since October 2007. 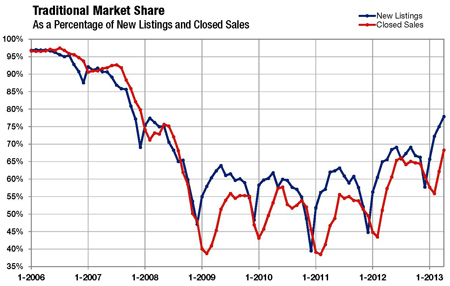 For closed sales, that figure rose to 68.4 percent, its highest level since July 2008. Seller activity was up 7.7 percent overall, while traditional new listings were up 28.0 percent, foreclosure new listings were down 25.6 percent and short sale new listings were down 39.5 percent. The 10K Housing Value Index – which controls for data variability – showed an 8.5 percent increase to $181,381. With only 3.1 months supply of inventory, more seller participation in the market is important to continued recovery. The traditional median sales price was up 8.5 percent to $216,000; the foreclosure median sales price was up 11.7 percent to $134,000; the short sale median sales price was up 5.1 percent to $135,000. Traditional sales sold in 90 days; foreclosures sold in 94 days; short sales sold in 178 days, on average. All information is according to the Minneapolis Area Association of REALTORS® (MAAR) based on data from the Regional Multiple Listing Service of Minnesota, Inc. MAAR is the leading regional advocate and provider of information services and research on the real estate industry for brokers, real estate professionals and the public. MAAR serves the Twin Cities 13-county metro area and western Wisconsin.